Flavius Heracles Augustus was Byzantine emperor from 610 to 641. His rise to power began in 608, when he and his father, Heraclius the Elder, the viceroy of Africa, led a revolt against the unpopular usurper Phocas. 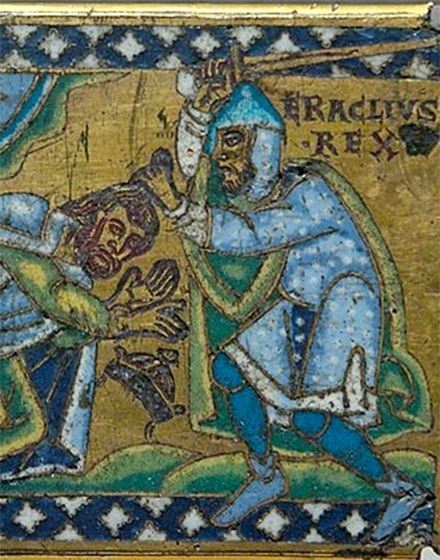 Heraclius's reign was marked by several military campaigns. He fought the Sasanid Empire from his ascencion in 610, and avoided total defeat before driving the Persians from Asia Minor in 627. The conflict had greatly weakened both the Sasanians and the Byzantines, so when the Muslim Arabs emerged from Arabia in 634 they quickly conquered the Sananian Empire - and then Mesopotamia and Armenia. By the time of his death in Constantinople, on February 11, 641, most of Egypt had fallen as well.